List changes: Veteran midfielder Sam Gibson and utility Curtly Hampton have retired, while father-son duo Ben Jarman and Jackson Edwards, and key position player Harry Dear, have been delisted. Summary: Experienced pair Otten and Cheney have yet to be re-signed. Alex Keath was solid when he came into the side and will put pressure on Kyle Hartigan. Milera impressed at half-back. Summary: The Crows could do with more back-up for 30-year-old ruckman Sam Jacobs. Speed through the midfield is another need. Ellis-Yolmen could be traded for more opportunities, while Signorello and Hunter could be delisted. Summary: McGovern's possible departure would leave the Crows light on for key forwards. Small forward is another need with 31-year-old Betts near the end of his career. List changes: Some experience has already been cut from the list led by Tom Bell and Rohan Bewick. Utilities Liam Dawson and Marco Paparone have also been delisted, along with rookies Jake Barrett and Claye Beams. Cian Hanley retired, returning to Ireland, earlier in the season. Summary: A really settled part of the list led by Andrews and Gardiner. There's good flexibility in most positions, although some line-breaking speed would be a nice addition. Cox could fit the bill if he develops. Summary: Plenty of quality with Beams and Zorko still A-graders, and McCluggage and Berry developing superbly. Still desperately need more depth though, particularly inside midfielders that can spread from the contest. Summary: Some genuine X-factor in this part of the ground with Hipwood, McStay, Cameron and Rayner. Should form the nucleus of an exciting forward line for years to come. List changes: Alex Silvagni has retired, while Aaron Mullett, Cam O'Shea, Matt Shaw and Jesse Glass-McCasker have been delisted. Summary: Carlton is relatively well stocked defensively. Marchbank, Plowman and Weitering will lead the club's future, while injuries to a host of general defenders in 2018 have allowed a number of Blues to be rotated through the backline. Summary: It's clear the Blues need more midfield depth. Curnow, Graham and Murphy are their only pure midfielders over the age of 24. While Cripps is a gun, he needs more experienced support around him. Summary: The Blues have a good core of young key forwards, led by Curnow, McKay and De Koning. They could use more small forward help, with Garlett, Wright and Pickett unable to go to the next level in 2018. Another pressure forward could be on their radar this summer. 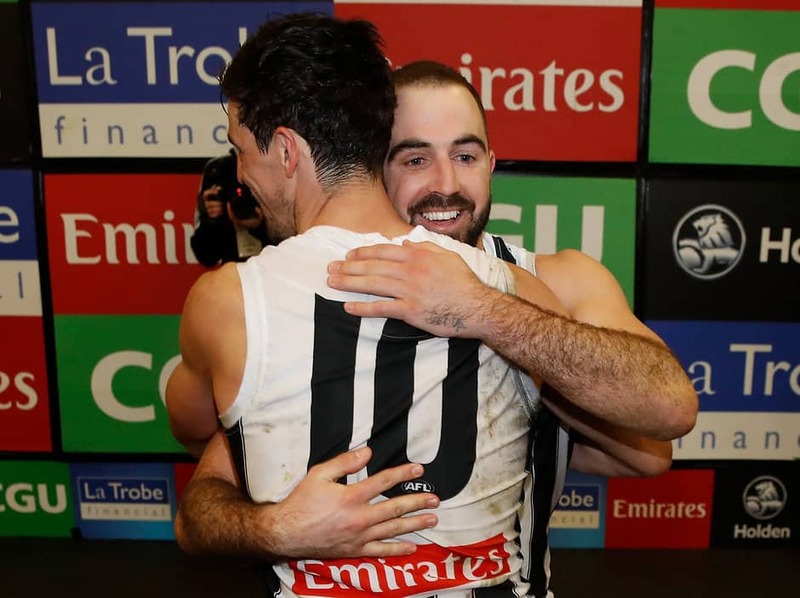 List changes: Free agents Alex Fasolo and Jarryd Blair have uncertain futures while Tyson Goldsack is also without a contract but is in line for another year. Sam Murray's future is clouded as he remains under ASADA investigation, while it's unsure if a diagnosed heart irregularity will allow Kayle Kirby to continue his career. Summary: Dunn wants to play on but remains without a new deal. Moore is also yet to sign, and with Dunn and Scharenberg out for a chunk of 2019 after knee reconstructions, would be a handy commitment. Madgen showed plenty late in the season while Langdon stood up during the backline injury crisis, but they'd love to add Steven May to their stocks in the coming months. Summary: The Pies engine room motored well this year and shouldn't undergo too many changes in 2019. Wells is committed to seeing through the final year of his contract despite another injury-hit season. Sier made huge in-roads this year while Sidebottom had a stunning season. Summary: The forward structure, consisting of mainly midfielders this year, has delivered. Hoskin-Elliott, De Goey, Thomas and Stephenson have all kicked more than 35 goals, while Mihocek has provided a solid target in the second half of the season. With Elliott expected to re-sign and Reid to put an injury-affected 2018 behind him, their forward stocks are in decent shape. List changes: Brendon Goddard, Jackson Merrett and Josh Green have already been told the club won't be giving them contracts for next year, but a number of other players remain out of contract. Jayden Laverde, Mitch Brown, Matt Dea, Michael Hartley and Shaun McKernan are among that group. Summary: The Bombers decided not to offer Goddard a contract for next year and with the depth in this area of the ground you can see why. They expect Francis, Ridley and Redman to play more games next year and have a number of running backs. Summary: It's little wonder the Bombers are searching for midfielders in this year's upcoming trade period. Langford came on this year, but they need a wider squad of ball-getters to choose from, plus some more class and size around the contest. Summary: Essendon managed well without Daniher for most of this season, with McKernan playing good footy before his hamstring injury. They have enough quality small forwards and medium options to be comfortable with their scoring power. List changes: Three veterans – Michael Johnson, Lee Spurr and Danyle Pearce – have hung up the boots, but the Dockers are delaying delistings while they sort through their recruiting and draft options. Summary: Plenty to like about a refurbished backline featuring Freo's better ball users around pillars Hamling and Pearce. Logue's return from injury as a third tall will add flexibility. Brennan Cox can offer key position support. Summary: The Dockers' engine room looks good on paper, but Mundy is 33 and Neale's future is unclear. Strong chance Blakely moves back into midfield, especially if Neale departs. Summary: There is a worrying lack of star power and out-and-out goalkickers in Freo's attack. Taberner has become so important given McCarthy's struggles and with Cox still finding his way. List changes: The Cats have delisted six players – Stewart Crameri, Aaron Black, Timm House, Ryan Gardner, Cory Gregson and Matthew Hayball. Summary: The emergence of Henry and Blicavs has dug them out of a hole. With Taylor expected to retire at the end of next season, key defenders will be on the shopping list this off-season. More dash off half-back to assist Tuohy is also essential. Summary: Outside of Constable, all of the Cats' genuine midfielders will be 23 or older next season. Time to bring in young top-end talent. The Cats were stretched in the ruck division late in the year with Stanley injured and Smith battling for form. Key forwards: Wylie Buzza, Tom Hawkins, Esava Ratugolea. Summary: The elimination final exposed Geelong's need for another key forward alongside Hawkins, with plenty of hopes riding on Ratugolea next year. With Cory Gregson delisted and the futures of Menzel and McCarthy pending, the Cats could be left thin for small forward options. List changes: Matt Rosa retired late in the season and Michael Barlow, Michael Rischitelli, Max Spencer and rookies Mackenzie Willis and Josh Jaska have been delisted. Rischitelli will be drafted again as a rookie for 2019. Summary: Possibly the best part of the list with Harbrow, Weller and Joyce rock solid at the smaller positions. Thompson had a career-best year, but May's future beyond 2019 is clouded and Leslie is out of contract. Desperately need key position help. Summary: Plenty of work needed here. Fiorini, Miller and Bowes all showed they can make it as first-choice midfielders but with Hall wanting out and Hanley cursed by injury, there's just not enough bodies to rotate through this part of the ground. Summary: With Lynch set to leave there'll be plenty of focus on Wright and Day next year. Martin remains a crucial cog with his ability to play tall, small and in the midfield, and his signature beyond 2019 is critical. List changes: There haven't been any retirement announcements or delistings at this stage, and while Heath Shaw will play on, fellow veteran Ryan Griffen is out of contract, and yet to make a call on his future. Summary: Plenty of depth in the back half, especially in the key positions with Adam Tomlinson also there for support after playing the year on a wing. Small defenders are also stacked. Summary: The midfield is clearly full of talent, but the ruck spot is a worry. Simpson looks the best option, with Lobb more effective forward, but the West Australian is improving. Summary: Greene and Cameron are the stars of this group but Himmelberg's emergence has been significant this season. Langdon was a genius selection, as was de Boer the year before. List changes: Cyril Rioli has retired. Ty Vickery was technically on the list in 2018 but called time on his career at the end of last season. Summary: Frawley turns 30 this month and the Hawks need to find a replacement for him. The backline looks awesome when it's up and running – Sicily and Stratton are stars, and so is Birchall when fit, while Burton and Morrison could be. It's a matter of having them firing simultaneously. Summary: Mitchell, O'Meara, Smith, Burgoyne and Shiels is a nice midfield but it's a class below the competition's elite onball units. Worpel showed he could soon be among that group. Summary: Roughead still contributes, but he's not the star he once was. Lewis is developing well in the VFL, having booted 37 goals from 17 games in the second tier this year, but might need another season before he becomes a consistent contributor. List changes: Veteran defender Bernie Vince has announced his retirement, which will occur at the end of the season, while Harley Balic has also hung up the boots. The Demons have not announced any delistings yet. Summary: Lever's return from a torn ACL will be an important boost for a Melbourne defence that has struggled to contain the opposition at times this season. The Demons have high hopes for last year's draftee Harrison Petty. Midfielders: Nathan Jones, Corey Maynard, Clayton Oliver, Billy Stretch, Dom Tyson, Jack Viney, Jay Kennedy Harris, Oskar Baker, James Harmes, Angus Brayshaw. Summary: Melbourne has one of the deepest midfields in the AFL and a silky-smooth outside ball user would complement their stocks nicely. The Demons have reported interest in North ruckman Braydon Preuss, while the 204cm Austin Bradtke – the son of champion Australian basketballer Mark – will join the club as a Category B rookie in 2019. Summary: The Demons do not anticipate Hogan's season-ending foot injury to affect him long-term, but it will be fascinating to see how Melbourne structures up forward when Hogan, Weideman and Tom McDonald are all fit. Former cricketer Guy Walker will join the club as a Category B rookie in 2019. List changes: The Roos delisted Billy Hartung, Mitch Hibberd, Dan Nielson, Josh Williams and rookies Tom Jeffries, Oscar Junker and Gordon Narrier, while Jarrad Waite called time on his 17-season AFL career. Summary: The Roos are stacked with both talls and smalls in defence, to the point where Durdin and McKay managed one game between them this year. Vickers-Willis will return from injury in 2019 to make it even more of a logjam. Summary: The Roos found some gems in Ahern, Anderson, Davies-Uniacke and Dumont, but they're targeting Jared Polec and Andrew Gaff to bolster this area. Preuss is looking elsewhere, including Melbourne, and would leave a ruck hole, given Xerri isn't quite ready if anything happened to Goldstein. Summary: The path is clear for Wood to shine and for Larkey to play more, while Brown is a star. Finding a speedy goalsneak, whether from another club or through the draft, should be a priority. Garner will be a handy inclusion if he can get fit. List changes: Defenders Jimmy Toumpas and Emmanuel Irra have been delisted, while veteran forward Lindsay Thomas has retired. Summary: The backline was one of the Power's strengths this year, even with Hartlett and Broadbent missing most of the season through injury. Contracted duo Hombsch and Pittard could be traded, while McKenzie is unsigned. Summary: The Power are in the box seat to secure West Coast free agent ruckman Scott Lycett to support 30-year-old big man Paddy Ryder. Polec's impending departure leaves a hole that Barry, Amon or perhaps exciting South Australian draft prospect Connor Rozee could fill, while Atley could leave for more opportunities. Summary: Once Dixon broke his leg late in the season, and with Marshall sidelined with injury, the Power lacked a key target in attack. Lycett's addition will allow Ryder to spend more time up forward. List changes: Ben Griffiths and Shaun Hampson have retired while Anthony Miles, Sam Lloyd, Corey Ellis and Jacob Townsend are among the uncontracted players with uncertain futures. Summary: The backline is in good shape. It's hard to argue with the combination of Rance, Grimes and Astbury, with Vlastuin, Broad and Ellis there to do the grunt work and Short and Houli to run the ball out. Garthwaite is coming along and Balta – who can play at both ends – showed plenty of promise in the VFL this year. Summary: Midfield likewise, although Miles and probably Lloyd will move on, which will reduce their depth. But there's a good mix of inside and outside talent, with Conca becoming more of a midfielder this season and Lambert going to another level. Summary: They've got a glut of small forwards, which will likely see one or two squeezed out. Higgins is a find, while Rioli is back to his best after missing half the year with a broken foot. Riewoldt was All Australian and won the Coleman Medal while Moore played six games. The big talking point is how Tom Lynch will fit into this structure if, as expected, he makes Punt Road his home. List changes: Sam Gilbert, Nathan Freeman, Hugh Goddard, Darren Minchington, Nathan Wright and Ray Connellan have been delisted, while Koby Stevens has retired. Summary: The list is loaded with mid-sized defenders. Coffield will eventually move into the midfield but the rest seem likely to play out their careers as backmen. Brown is still doing his job well but turns 30 in December, with Austin on hand to replace him. Summary: Short on class and pace here. Clark split his time up forward and down back this season but will probably graduate to a midfield role next year. The Saints' ruck department is among the weakest in the competition. Key forwards: Josh Battle, Josh Bruce, Rowan Marshall, Paddy McCartin, Tim Membrey. Summary: St Kilda lacks a No.1 option in attack. McCartin hasn't shown he can stay fit, Bruce probably isn't good enough, Membrey is too short at 188cm, while Marshall and Battle are inexperienced. List changes: The Swans haven't delisted any players yet, with their NEAFL side to play in the Grand Final this week, and there haven't been any retirements. The future of Alex Johnson is still up in the air, but he's expected to want to play on despite yet another knee reconstruction. Summary: Rampe, Grundy and Aliir are a solid trio of key defenders, with Melican to put the pressure on if he can get on the park. Lloyd remains unsigned and should be the club's No.1 priority. Summary: Definitely an area of concern for the Swans, with leg speed a priority. Ling should help that once he gets his body right, as will Stoddart, but another established midfield free agent would be preferable. Summary: Another area that needs work, and support for Franklin is critical. Reid is the answer, but his body has stopped allowing him to be the star he could be. McCartin will develop even more but still needs another season to add bulk. List changes: No delistings or retirements yet, although injury-plagued full-back Eric Mackenzie seems likely to hang up the boots. Summary: Settled and versatile group has most bases covered, although if Mackenzie retires more key defensive support would be useful, and Bulldogs free agent Jordan Roughead could help out here as well as in the ruck. Summary: If Lycett wants to leave as a restricted free agent, the Eagles will be short on ruck depth with Naitanui out for most, if not all, of 2019. The midfield has delivered this year but would look thinner if Gaff doesn't re-sign. Summary: The Eagles have regenerated the forward line with great results this year. Ryan and Rioli have addressed a dire need for pace, pressure and X-factor. Allen and Brander can play either end, and Waterman showed plenty of potential as a third tall. List changes: Premiership forward Luke Dahlhaus has already walked out on the club and is expected to take up a free-agency offer from Geelong, while third-year key defender Kieran Collins and rookie tall Nathan Mullenger-McHugh have been delisted. Flag stars Clay Smith and Shane Biggs have retired. Summary: The Dogs have plenty of depth in key defenders and have a young and developing core of smaller backmen lead by skipper Wood and Dale Morris. Summary: Father-son recruits Liberatore and Wallis remain unsigned but are likely to stay. Premiership star Roughead is likely to leave via free agency, while fellow ruckman Campbell will be traded or delisted. Summary: Redpath's knee problems are likely to see him retire, while Honeychurch is expected to seek a trade to Gold Coast. Picken has vowed to play on after his concussion issues over the past 18 months.